Friday's announcement marks a new low in the career of the once-famed South Korean scientific superstar, who was feted by the nation for his claimed breakthroughs in a promising new medical field. Prosecution official Lee In-kyu announced the indictment against Dr Hwang, as well as charges against five members of his research team, during a nationally televised news conference. Of the other scientists accused, one was indicted for obstruction of duty, three for fraud and one for violation of bio-ethics laws. Dr Hwang made news around the world, and became a national hero, when he claimed in the journal Science to have created a stem cell line from a cloned human embryo. He then published another paper, saying his team had extracted material from cloned human embryos that identically matched the DNA of 11 patients. This research appeared to bring researchers closer to the point where they could offer personalised cures, using tissue grown from embryonic stem cells to repair damaged organs or treat diseases like Alzheimer's. 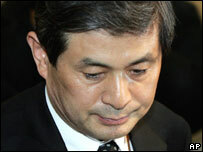 But Dr Hwang suffered a spectacular fall from grace when he was found to have faked key points in both research papers. A Seoul National University panel found in December that the research was "intentionally fabricated", and Dr Hwang stepped down from his post as professor at the university shortly afterwards. Prosecutors have been investigating Dr Hwang's team ever since. In their statement on Friday, they said their probe confirmed that the scientists' claims regarding stem cells were fraudulent. They said Dr Hwang had himself been cheated by one of his assistants who claimed to have cloned embryonic cells, but that he then compounded the fraud by fabricating further research. He is also accused of embezzling research money. At the end of last year, he had received 41.7bn won ($42.2m) in government funds for his research, as well as 4.3bn won ($4.35m) from private foundations, state auditors said. But the Board of Audit and Inspection has been unable to account for 2.5 billion won ($2.6m) of that money. Prosecutors claim he bought a car and paid contributions to politicians and company officials who helped to arrange his grants. He is also accused of using part of the money to purchase human eggs from donors, which is against South Korean law on bio-ethics. The misuse of state funds carries a jail term of up to 10 years, while a violation of bio-ethics laws can mean up to three years in prison.